The Araneta Group is a progressive and diversified group of companies anchored on Property Development, Food Service, Leisure, and Hospitality. With a long history of embarking on business ventures that are characterized as the first, the biggest, and the best in its class, and with 108 years of diverse business experience, the Araneta Group is prepared to take up the challenges of the 21st Century. The Group’s 12,000-strong workforce is committed to a culture of excellence, integrity, loyalty, and pride. The Araneta Group is composed of five strategic business units, namely the Araneta Center Inc., PPI Holdings Inc., Uniprom Inc., Progressive Development Corporation, and Araneta Hotels Inc.
Araneta Center, Inc. is the owner, developer and manager of the Araneta Center. 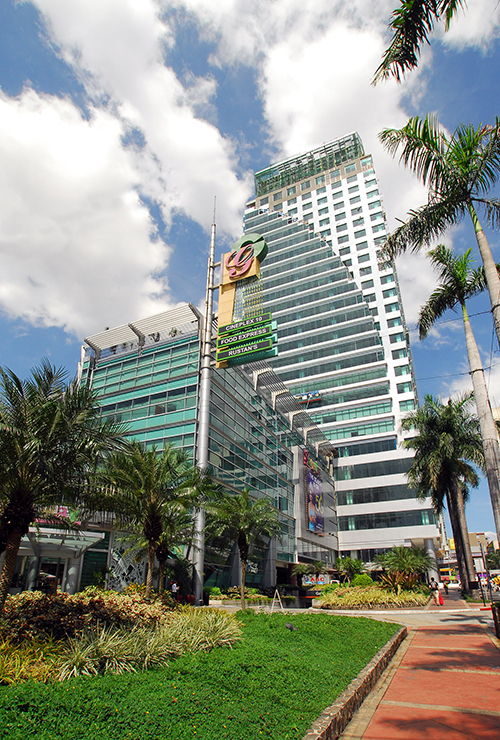 Built and developed on a 35–hectare (90 acre) property right at the heart of Metro Manila, The Araneta Center is a hub of retail, entertainment, residential, hospitality, and office developments that sees an estimated 1,000,000 visitors daily.Learn more. PPI Holdings, Inc. is the franchisee of Pizza Hut, Taco Bell, and Dairy Queen in the Philippines, with over 300 company owned food service outlets (over 200 Pizza Hut and 6 Taco Bell restaurants and over 100 Dairy Queen outlets). Worldwide, Pizza Hut is the largest and most recognized pizza chain with over 16,000 restaurants in 100 countries. Taco Bell and Dairy Queen are also number one in their respective categories.Learn more. Uniprom Inc. (UI) manages the leisure and entertainment ventures of the Araneta Center: Smart Araneta Coliseum, New Frontier Theater, TicketNet Online, Gateway and Ali Mall Cineplex. Learn more. Progressive Development Corporation manages investments and property assets of the Araneta Group outside the four other strategic business units: Araneta Center, Philippines Pizza Inc., Araneta Hotels Inc., and Uniprom. PDC is also the incubator and nurturing entity for new business.Learn more. Araneta Hotels Inc. is the owner and developer of the deluxe businessman’s hotel Novotel–Manila Araneta Center, the first Novotel brand of AccorHotels in the country.Learn more. TEOFILO "TEDDY" R. ASUNCION Jr.